A young woman has made her solemn profession as a Carmelite nun in Birkenhead several years after attending a vocations event. Sister Maria Graziella of Jesus Crucified took her vows from behind the grille of the Carmelite Monastery of the Annunciation. The 28-year-old entered religious life after a conversation with a Carmelite priest at a vocations fair at St Mary’s College in Oscott, Birmingham, enkindled a sense of vocation to consecrated life. 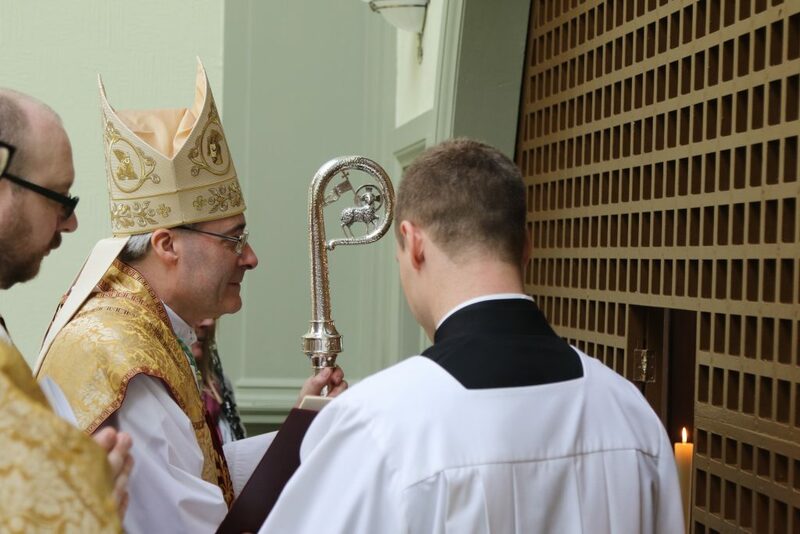 After five years of preparation in the Carmel, she made her solemn profession on the Feast of the Annunciation during a Mass celebrated by Bishop Mark Davies of Shrewsbury. In his homily, his homily, said that the Carmelite life bears witness to how God chooses to act in “silent and hidden ways”, Sister Maria Graziella was giving witness “in a generation overwhelmed by all the uproar and changing images of 24/7 communication, and strangely enthralled by the cult of celebrity where we supremely value being noticed”. “Here Sister Maria Graziella enters a great and beautiful silence in which she dedicates her entire life in a way that will always be hidden from human view and yet is given for all humanity, every soul and especially as St Teresa (of Avila) insisted for the holiness of priests,” said Bishop Davies. “Pope Francis reflected in his recent letter on The Call to Holiness how the real story of humanity is now being written in ways we do not see or barely glimpse. “The Holy Father repeated the beautiful words of St Teresa Benedicta of the Cross, the remarkable Edith Stein who journeyed from the darkness of intellectual atheism into the silence of Carmel and finally gave her life in the death camp of Auschwitz. “She wrote, and the Holy Father re-echoed these words, ‘The most decisive turning-points in world history are substantially co-determined by souls whom no history book ever mentions. And we will only find out those souls to whom we owe the decisive turning-points in our personal lives on the day when all that is hidden will be revealed’. Bishop Davies reflected on how God had chosen to enter history in the “hidden” places of Nazareth and Bethlehem, adding that “for us it is in the same hiddenness and silence of the Holy Eucharist that Jesus now choses to remain with us in a love which goes so far”. Bishop Davies added: In the prayer we offer today for Sister Maria Graziella of Jesus Crucified may this Carmelite path of hiddenness and silence be cherished and flourish amongst us. Mother Bernadette of the Heart of Mary, the Mother Prioress, said that Sister Maria Graziella came from a London family who had relocated to Liverpool. She said that during the time Sister Maria was discerning her vocation, she worked with the poor and also collaborated with the Missionaries of Charity in Liverpool. Sister Maria, she said, was very much a woman of her generation in that she was “determined”” to seek what she believed was right for her. “They are very simple and they are very focused on what they want when they know when the Lord has called them,” said Mother Bernadette. Sister Maria Graziella, she said, was “very committed to this vocation”, adding that she also had a “great devotion” to Mother Mary of Jesus, a French Carmelite who founded Birkenhead Carmel from Notting Hill in 1918.